Middle school seems to be the prime age for students to get their first cell phone. Cell phones are great for students to keep in contact with their parents or let them know that they are staying after or about a change in sports plans, but they also can cause a lot of anxiety, stress, and grief for their young users. I have many conversations with students about cell phones and the texts they received that were very offensive and hurtful. Even though many of these conversations occur off school grounds, they carry over into school. Parents really need to be aware of the potential dangers of cell phone and internet usage and how to create ways for their children to use technology wisely. 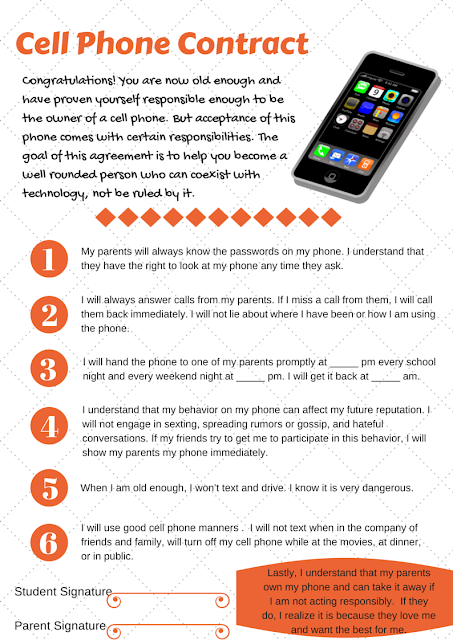 After doing some research, I created this Cell Phone Contract for parents and students. I created it using Canva, an online design studio. If you click on the photo you should be directed to the link to print off your own copy, otherwise, Click Here. I will be using this for my Coffee With The Counselor on November 25th. I am still working on some other handouts for parents and will post when I am done.